Beyond Remebrance Days events, CBC personalities Shannah-Lee Vidal and Colton Hutchinson offer a few lighter entertainment options for the Nov. 9-11 weekend. While there are still abundant entertainment options in Winnipeg this weekend, there are also several more serious events of remembrance happening throughout the next few days. Each year on Nov. 11, Canadians collectively remember and mourn our fallen soldiers. The date signifies the signing of armistice to end the First World War, which occurred 100 years to the date this Sunday. Ceremonies and special events will be held across the province throughout the weekend for Remembrance Day. This Sunday, a number of Royal Canadian Legion branches in Winnipeg will hold public services, in addition to the City of Winnipeg's service at the RBC Convention Centre. At sundown on Nov. 11, you may also hear church bells ringing around the city. Across Canada, church bells will ring out in an event called Bells of Peace, to commemorate the signing of the armistice 100 years ago. And Saturday evening, the RCAF Band will mark the end of the Great War with a concert titled For Valour: A Musical Commemoration of the End of the First World War. That concert takes place at Westminster United Church Saturday at 7:30 p.m. Beyond those events, CBC personalities Shannah-Lee Vidal and Colton Hutchinson offer a couple of entertainment options for the Nov. 9-11 weekend — one that seems fitting for a Remembrance Day weekend, and one that's a little more … unusual. For my selection this week, I am sending you back in time to see life through the eyes of a woman waiting for the Canadian soldier she loves to return home from the First World War. 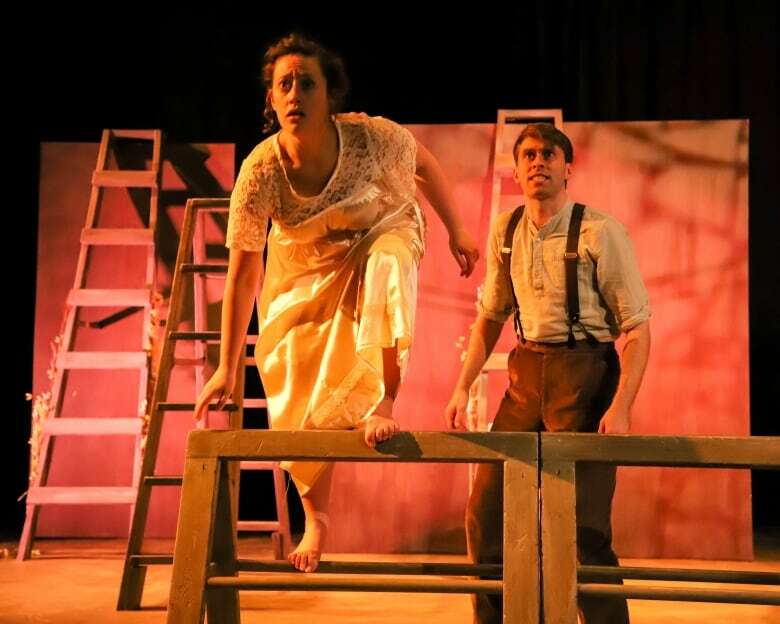 Theatre Projects Manitoba is reflecting on war and remembrance through its production of the play Mary's Wedding. The play begins just after the war as Mary, the lead character, is awaiting marriage. It's the eve of her wedding, and she is dreaming of her romance with Charlie. Mary lets the audience inside her memories, through a series of flashbacks and flash-forwards. Slowly, we discover how love blossomed between Mary, a recent English immigrant to Canada, and Charlie, a Prairie farmer who writes letters to Mary after he goes off to war. Sarah Flynn, who plays Mary, and Justin Fry, who plays Charlie, are the only cast members in Mary's Wedding. The pair have recently returned from performing the play throughout the Interlake area, where they met with many people who had family members who served in wartime. Mary's Wedding now running in Winnipeg at the Rachel Browne Theatre (211 Bannatyne Ave.) until Nov. 18. Performance times this weekend are Friday and Saturday at 8 p.m., and Sunday at 2 p.m. The Friday and Sunday shows will be followed by a talk back. Tickets are $27 for adults, with reduced rates for seniors and students, and can be purchased at Theatre Projects Manitoba's website. What do Ozzy Osbourne and Ronald McDonald have in common? Apparently, a love of heavy metal. The two seemingly disparate figures in pop culture come together through the band Mac Sabbath. The band's riffs will be more than familiar to metal fans. The lyrics, however, take on a meatier twist. Redefining the music of Ozzy's band Black Sabbath, Mac Sabbath frontman Ronald Osbourne and crew take on the themes of fast-food fantasy, GMOs, and time travel in the band that bridges parody and tribute. Starting out as a joke idea in a Los Angeles burger shop, the group of misfits decided to take their love of Sabbath and their love of fast food to the ultimate level. 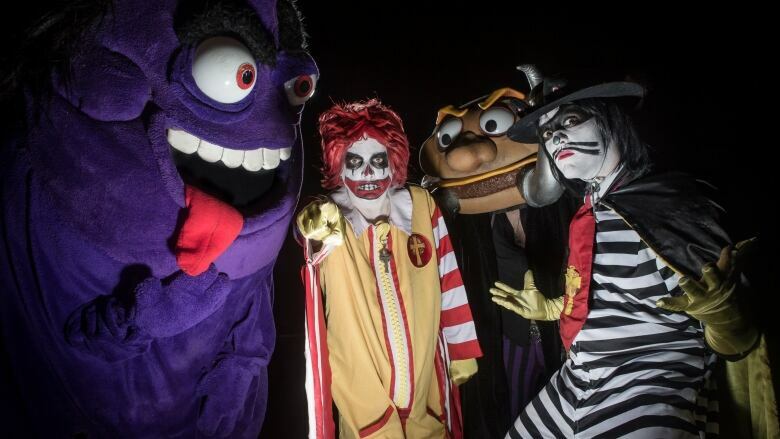 Grimalice, Slayer MacCheeze, and the Catburglar back Ronald in full costume, made up to resemble mutated versions of the classic McDonald's gang of characters. Screaming about the lost art of organic food and heavy riffs, Ronald Osbourne looks to warn the public about the dangers of government-controlled food products, travelling through time from his 1970s origins in an "enchanted forest where hamburgers grow on trees." I love you sweet beef, every last steer." An excellent idea for a silly music video or two, but how far can the gag go? All the way across Canada this month. 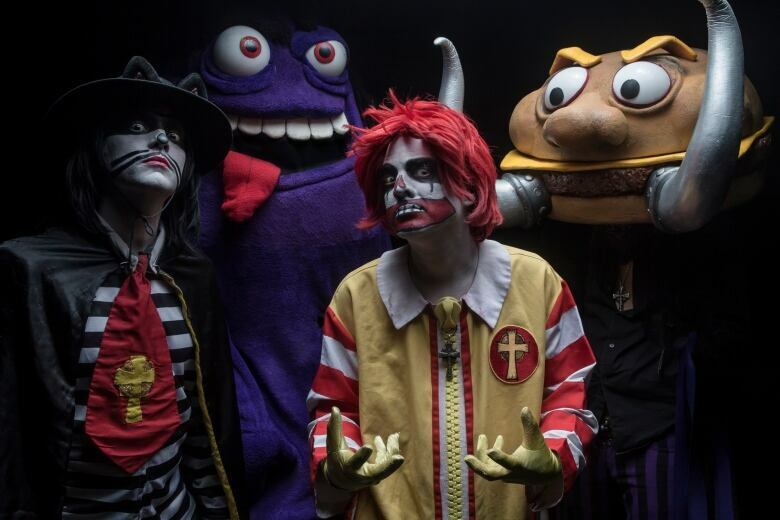 In their first Canadian tour, Mac Sabbath hits seven cities with an earful of bleached buns and mutated meat. Winnipeg has its turn with the cheesy, deranged fantasy rockers this Sunday at the Pyramid Cabaret. A part of me is excited to see my favourite Black Sabbath songs reimagined in a fast-food circus. The other part wonders what the vegetarian Prince of Darkness, Ozzy Osbourne, would have to say about all of this. With files from Colton Hutchinson and Shannah-Lee Vidal.